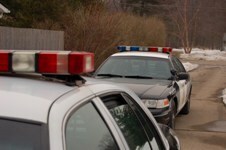 The Patrol Bureau is responsible for carrying out the primary mission of the Police Department by providing around the clock protective service to the citizens of North Ridgeville. While emergency calls for service are the first priority, all calls are answered in a timely and professional manner. When not tasked with these calls, officers actively patrol the city. While on patrol, officers are vigilant to detect and prevent threats to the community, whether the threat is criminal activity, a natural disaster, or breaches of the public order and safety. To provide constant service, the Patrol Bureau operates two, twelve hour shifts throughout each twenty-four hour period. Each shift is led by a Lieutenant as the shift commander and also one patrol supervisor at the rank of Sergeant who assists in supervising the patrol activity. In order to facilitate complete and efficient service, the city has been geographically divided into three zones. These zones roughly encompass the Northeast, Northwest, and Southern portions of the city. At the beginning of each shift, officers are first assigned to patrol one of these zones. After each Zone has been assigned to one or more officers, the remaining officers are assigned their particular duties. These additional duties may include backing up other officers responding to dangerous calls for service, conducting targeted patrols to counter specific criminal activities, seeking wanted fugitives within North Ridgeville and surrounding communities, and providing additional traffic enforcement in high accident or violation prone areas. The Detective Bureau is a dedicated unit of the police department, with multiple tasks and duties assigned to it. Detectives are typically assigned cases by several means. Patrol units will refer cases to the Detective Bureau when the proper investigation of the case significantly impairs their regular patrol duties, or when it requires the specialized resources and expertise of the detectives. Investigations can also be originated exclusively by a detective in many ways. Cases of a sensitive nature are usually investigated by the detective bureau from the beginning, or when another agency refers a case directly to the detective bureau for further investigation. The detective bureau works closely with many different agencies to complete their investigations. The Lorain County Prosecutor's Office, Lorain County Children Services, the Federal Bureau of Investigation and U.S. Marshal's Service are among the many agencies that the detective bureau routinely assists, and receives assistance from. The detective bureau is also responsible for the background checks of potential applicants for police officer and dispatcher. A typical background check may take weeks to complete, and includes a criminal history check, an interview with all past employers, a credit check, a home and neighborhood visit, and a computerized voice stress analysis exam. In addition to these tasks, a detective is also in charge of the evidence room, in which many hours are spent managing incoming and outgoing evidence.